Hi,I'm new to this site, but I have read some of the stories and I find it in my heart to tell you my sons story. 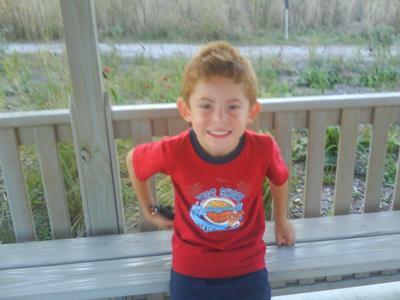 To start off His name is Braxton he is 5 years old, He has been diagnosed with Sensory Integration Dysfunction. He just got diagnosed on 10-21-2008. He has went to OT one time. He was fine as long as he was running around playing with all the toys but soon as she started to do the brushing he went bes-irk and tried to bite her,hit her,and punch her. He was a totally different child. kids. He would line up his toys,spin things around,very organized,and I had him tested for Autism. One DR. said he had it then he got retested and the other DR. said he didn't have it. He outgrew all the signs of Autism. So he went to PRE and they said he was testing way below his age and they put him into speech therapy. And this year has been one hard year his behavior has went down hill... he screams,hits,and bites ME. So that's how we got sent to this new DR.that said he has Sensory Integration Dysfunction. All I want out of life is for my son to be OK. So does someone have some behavioral advice to pass along. I would appreciate it. Thanks to everyone and God Bless you and your wonderful family! My 4 year old son Christopher was just recently diagnosed with SPD. One thing I find odd is that after I had Christopher I went through a very bad postpartum and always felt tired and run down. I was diagnosed with hypothyroid at this time. I take medicine for it now and am fine but i wonder if there is any connection with it and the fact your son was diagnosed with it as well. Crazy thought but I just wish there were answers. Also, my son at 6 months old had surgery and was put under anesthesia. I often wondered if that had something to do with the disorder. Well I wish you the best of luck with your son. Hope that helps. I'm sending lots of positive energy your way! Lisa,I have two boys that have SPD. My youngest is 7 and we had the same experience with him when he was a baby - he was colicky for a year and a half. We spent many nights walking the floors with him -- if only I knew then to take off his clothes and keep him in just a diaper things would have been great. Kellen lines up his toys all the time, hums when he eats, and hates bright lights and loud noises. Now, he cannot stand to wear clothes at home, hates socks with "lumps" in them (just ordered online seamless socks). I can tell you to read this book and that, but, I have learned that everyone deals with things differently and just keep logging onto these sites and look at what others are doing and saying.. you don't feel so all alone! If you want, you can Email me at mommarden@aol.com to vent. I am looking online tonight for homeschooling methods as my kids are struggling at school with friends and learning. So, I really need to look into what I can do for their self-esteem and education. Hope you are well and hang in there. I recommend Sensational Kids by Lucy Miller (she is the leader in SPD research). Please know that it is not yet an "official" diagnosis, which makes insurance companies loathe to pay for treatment. The Out of Sync Child is good to help you understand the "disorder" but not really parenting advice. For straight parenting advice, I recommend How To Behave So Your Children Will Too by Sal Severe. I got all 3 books from my library, with no cost, and then bought the one I liked the best used on ebay. The OT should have some suggestions as well. If your son doesn't like brushing....there are plenty of other things they can do.....the trampoline, the tunnel crawl, scooter board, etc. My kid thinks OT is fun, and we will "play OT" at home. He was just evaluated at age 4 1/2 and has had 14 OT sessions to date. Everyone has noticed significant improvement. Hang in there and be patient! !